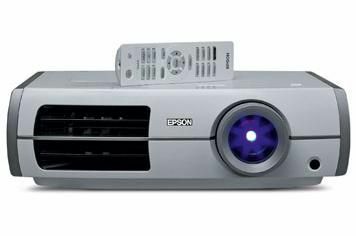 Epson EH-TW3600 review | What Hi-Fi? This is a first look at Epson's new £1300 EH-TW3600 model – the replacement for the fine '3500. So what does your £1300 get you? Well, this is a 1920 x 1080 resolution projector, more than happy to receive a Full HD signal. It's decently connected, too: two HDMI inputs, plus component, S-Video and PC inputs should serve you well enough. It's easy to install, too, using the zoom and focus on the lens, plus position controls on the top of the machine. This is a 3LCD machine, so it uses three LCD panels through which the primary colours are directed. A claimed contrast ratio of 50,000:1, a brightness rating of 2000 lumens and a fairly quiet 28db noise level complete the specifications. Projecting the Blu-ray of Inception, it's clear that the Epson is very capable. The colour palette is balanced, offering true, natural colours while also making the most of brighter, more dynamic hues. Black levels are impressive, too, the 3600 digging out detail from darker scenes in which is renders deep, solid black levels faithfully. Skin tones are natural but with enough colour and life, while the overall level of insight and subtlety is commendable for a projector at this sort of money. Jump up to the £2k mark and you'll lose a little noise and gain a little more grip with fast motion, but for this money, there's not much to mark this Epson down.